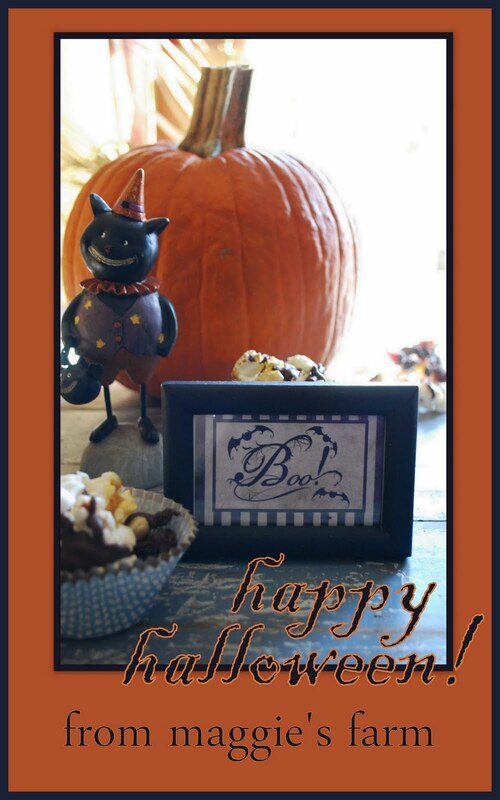 Stay safe all you little ghouls and goblins! When I was a little girl, I was awfully excited to buy a pumpkin at the grocery store. In my little world, there was Charlie Brown, and his tale of the Great Pumpkin, there was Cinderella, who rode in a pumpkin carriage, there was Peter, Peter, Pumpkin Eater, and there were Jack O'Lantern pumpkins. From the produce department. Every year we had one, and every year I asked if we'd be cooking it. "Do you mean are we carving it?" "No, are we cooking it?" "Silly! You don't cook pumpkins." "Where does pumpkin pie come from?" My mother kept the most perfect home of all my peers', and I was dressed to the nines, all straightened and starched, for every occasion. I had pigtails that were stretched perfectly tight, and exactly symmetrical, even though my head was decidedly not. And I must say that we were always well-fed, never went hungry, enjoyed delicious holiday dinners with home-baked pies, always. But cooking fresh vegetables, unless potatoes, was very rarely part of her plan. And cooking pumpkin, well that was never part of her plan. I was never going to get to cook that pumpkin. Even though it came from the grocery store. That is, until I bought my own pumpkin(!!!). The first time I attempted it, I tried to cook the huge pumpkin I'd selected to carve-- carve, that is, until I got the grand idea to do what I'd longed to do all those years. I stopped myself, special only-for-carving-pumpkins knife in hand, taped on some construction paper features, and waited until the day after Halloween to carry out the grand scheme. I had absolutely no idea what I was doing, but that never stopped me. And it still doesn't, though I've thankfully gotten most of my Lucy Ricardo-esque kitchen moments behind me. For a few years now, anyway. Friends, I'm going to save you all the mess of the story and cut to the chase. I tried to boil every bit of that pumpkin, save for the pulp and seeds (I'd figured at least that much out on my own, never having bitten into a seed whilst pie-eating) and turn it into, what I hoped, ney expected, to be an elegant pumpkin bisque. I produced 6 gallons, and spent a whopping 50$ for extra ingredients, in the making of pumpkin bisque. And I lived alone. And 6 gallons of pumpkin bisque is not, no matter how I creme fraiched it, I'm sad to report, elegant. I couldn't give the stuff away. No, really, I tried. But this sad girl who lived alone in a strange new city had no foodie friends, in fact not many friends at all. I loaded my parents down with a gallon, they being too kind to remind me that there, in fact, were only two of them. And I ate pumpkin bisque for a month. Breakfast. Lunch. Dinner. And I didn't eat pumpkin anything for about 8 years after that. I've grown since then. Rather pumpkin-like, I might add. But I really mean I've grown in the kitchen. I'm like a grown-up chef, now. 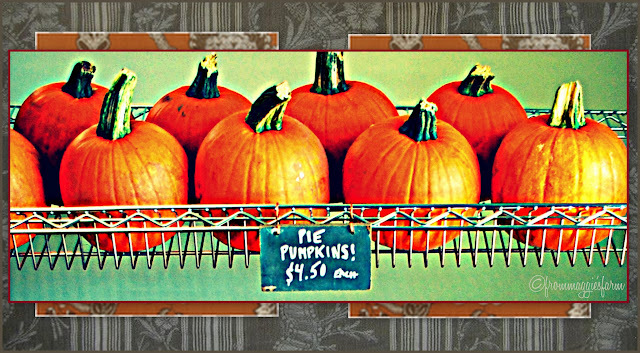 I can make fresh pumpkin, manageably, in about a dozen ways. I've made cassoulets, pumpkined-up bread puddings, smoothies, snacks, and, now, a way better bisque (all to be blogged, of course) than before. But, hands down, my simplest preparation is roasted pumpkin. Afterwards, I cut those last slices into manageable chunks. I pull out a big cast iron skillet, preheat my oven to 450 degrees, then pull out the magic. 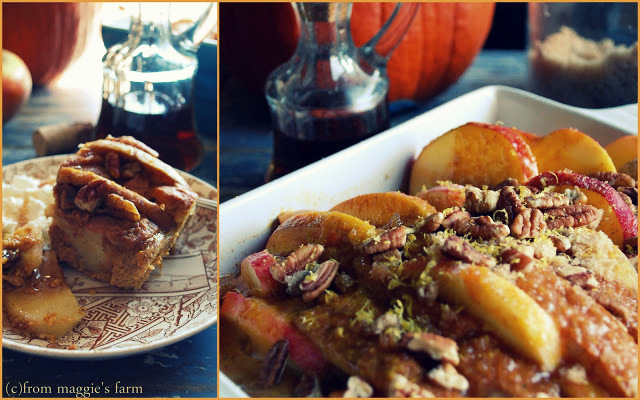 You can go two ways with pumpkin--savory or sweet. Or the third way, because I always go the third way in a two-way game--savory and sweet. My basic formula is pumpkin + fat + seasonings + high heat = oh-yes-that's-so-good. And so simple. And so fast. And, yes, so healthy, too. Brown 4-8 ounces pancetta (or proscuitto, or Virginia ham, or plain ham, or even salt pork, but just not smoked bacon, because it'll be more about the smoked bacon than the pumpkin if you do), in a large cast iron skillet. Pour off all but a scant teaspoon of drippings. Toss pumpkin in, along with garam masala spice blend, to taste. I used about 1 tablespoon, buy I'm a little heavy-handed for some people's taste, so start with, say, 1 teaspoon. You can always add more at the end, as long as it's still hot. I add a little bit of kosher salt. Salt enhances sweet, but remember that your pancetta is a touch salty, too. You can skip this step if you're watching your sodium intake. 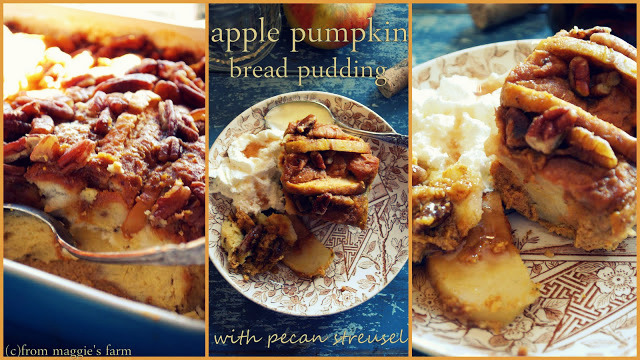 Drizzle one tablespoon pure maple syrup over pumpkin, and toss to coat all. Roast, uncovered, for 25 minutes, stirring occasionally. Add about 1 tablespoon apple cider vinegar, stirring up all the pan drippings and making sure to mix them in well with the pumpkin mixture. Slide them back in the oven and roast until they are fork-tender--not too mushy. Why should the kids have all the fun?! This is what we'll be munching on as we hand out treats this week. I'll have about a cup, and then a certain farmer will lock himself in a closet with the rest. It's addictive, friends! Pop popcorn according to package directions. 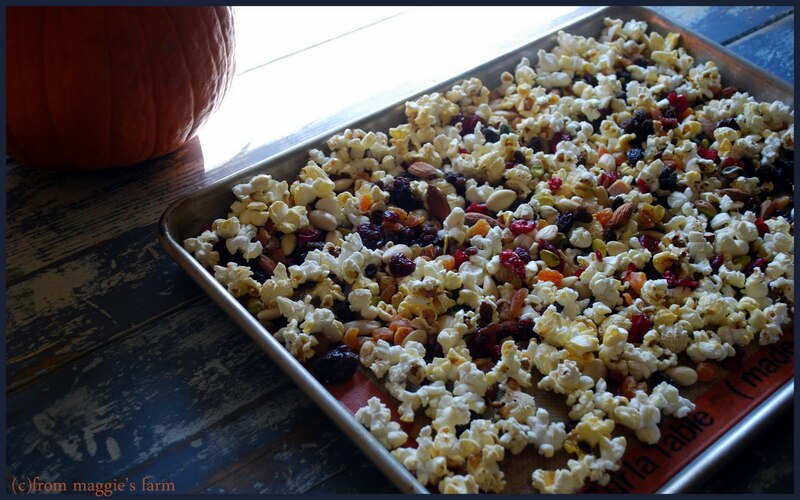 Try kettle corn, really is perfect for this. Strew on silpat (or cooking spray) lined baking sheet. 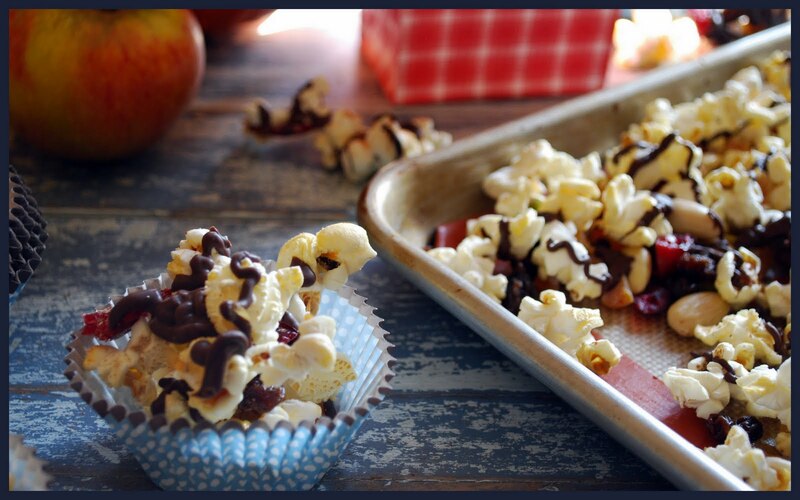 Let it mingle with whatever treats your heart desires-- we used almonds, pistachios, and dried mixed fruits. Season with your favorites-- we used a little cayenne on one batch, a little chat masala, a popular indian snack spice mixture, so goooood, on another, and simply a little sea salt on a third batch. We talk a mean game, but we'll break down and share it with the neighborhood kids. We gently break off pieces to share in baking treat bags, and a few in cupcake liners for the kids who hang around to play with the animals a bit. 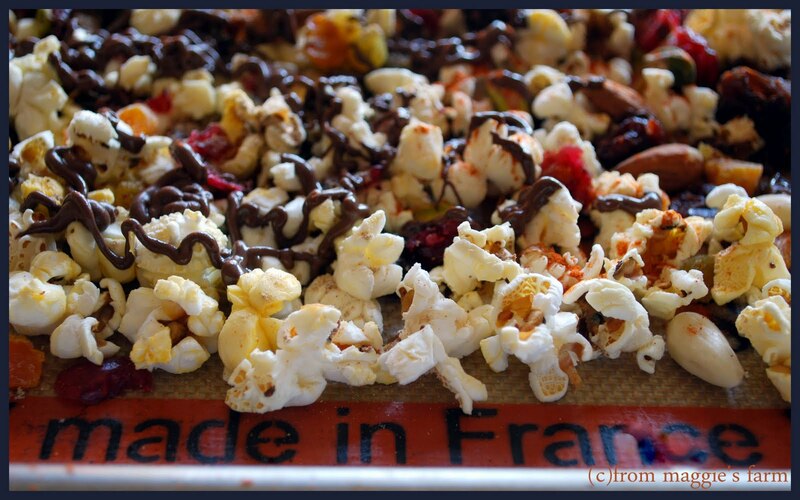 'Cause really, if we don't share, we'll eat the whole batch (or 2 or 3) for dinner. And maybe breakfast the next day. 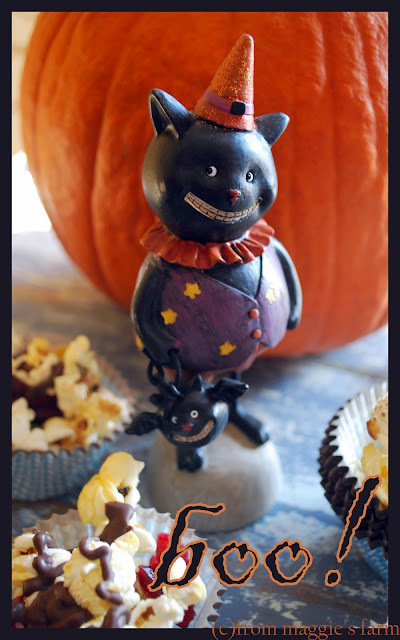 Pumpkin patches, pumpkin parties, pumpkin costumes, pumpkin decorations. Pumpkins everywhere! Why, we just had pumpkin yesterday, and we'll be having pumpkin tomorrow, too. And in the meantime, oh the delicious meantime! Delicious, because we used yesterday's leftover pumpkin, peeled and diced it, wilted it in a skillet with a little water added to keep it from sticking, cooking, covered for as long as it took to become tender (45 minutes for us), then transferred it to a processor and whirled it around until it was puree. You could do the same thing, too. Or, you could roast it and puree it. Or you could steam it over a pot of simmering water. Or......you could buy it pureed. I've seen a few organic canned products out there, and I'm not judging. Whatever you do, get your hands on some puree. 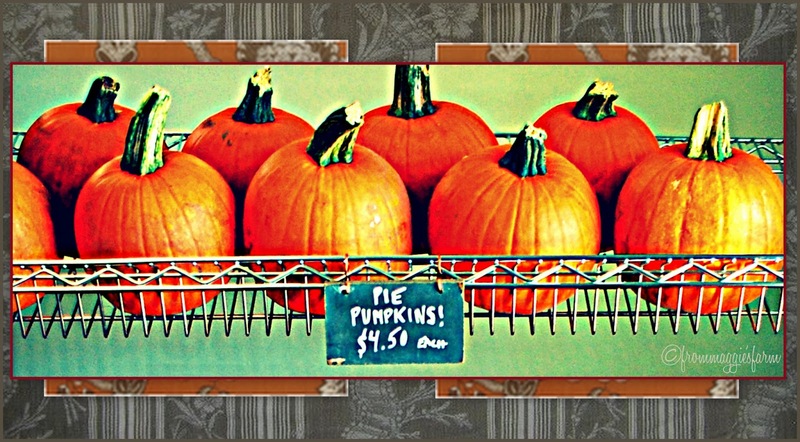 Pumpkin is often overlooked by superfood devotees, but it packs a nutritional wollop. It's bright orange color is already a dead giveaway--it's packed with antioxidant carotenoids, vitamin A, and a good source for other vitamins and minerals including iron, potassium and magnesium. Relatively low in carbohydrates, half a cup of puree boasts 3-4 grams of fiber. In these days leading up to the El Dia de Muertos, (the Day of the Dead), the holiday observed in Mexico on November 1st, to honor ancestors, past, Mexican bakeries are filled with loaves of pan de muerto, the traditional celebratory loaf, fragrant with just a hint of anise. Happily, we are beginning to see American bakeries offer this special treat, too. We pull off pieces straight from the fresh loaf, we occasionally toast it, we've made creole pain perdu from it, and still we've had leftovers. 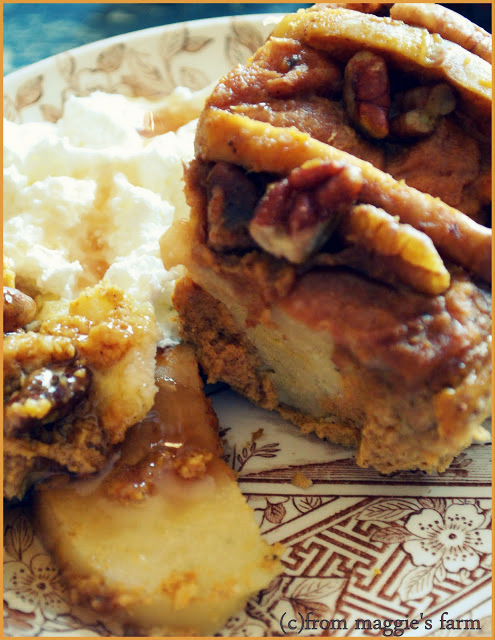 If you find yourself with a little bit, or a lot, of leftover pan de muerto (or any bread, actually), a little past its prime on your hands, why not try it in a southern staple--bread pudding? Fusing the cuisine of the Creole South with that of Mexico, both created out of lack, and honed to create a delicious plenty, is a natural fit, and this combination will knock your standard bread pudding out of the park. Slice bread approximately 1/2 inch thick. Layer in baking dish (they will eventually be standing straight, see below). Tuck apple slices between each bread slice. 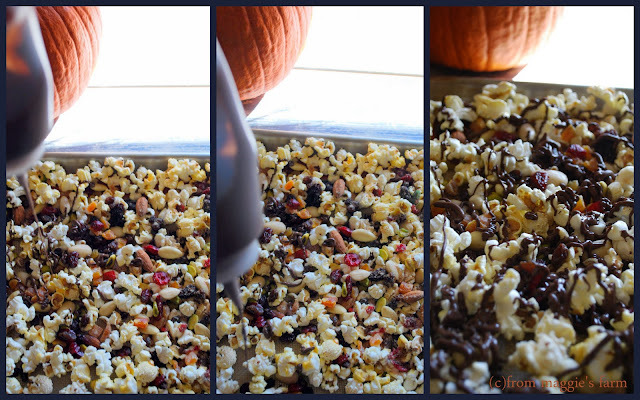 Combine, mixing well, pumpkin, milk, eggs, brown sugar, and spices. Pour over bread and apple slices. Prior to baking, preheat oven to 325 degrees. Prepare streusel by cutting in butter, flour, brown sugar, and cinnamon. Fold in pecan pieces. Bake, covered, for 45 minutes, then remove cover and bake an additional 15 minutes, or until streusel is browned and pudding is set. Serve warm or room temperature (or cold, standing in front of the fridge, with nothing but a spoon and the ding-ding-dinging of the door's-open alarm). Whipped cream and maple syrup are good accompaniments, but honestly, I love it just as it is. 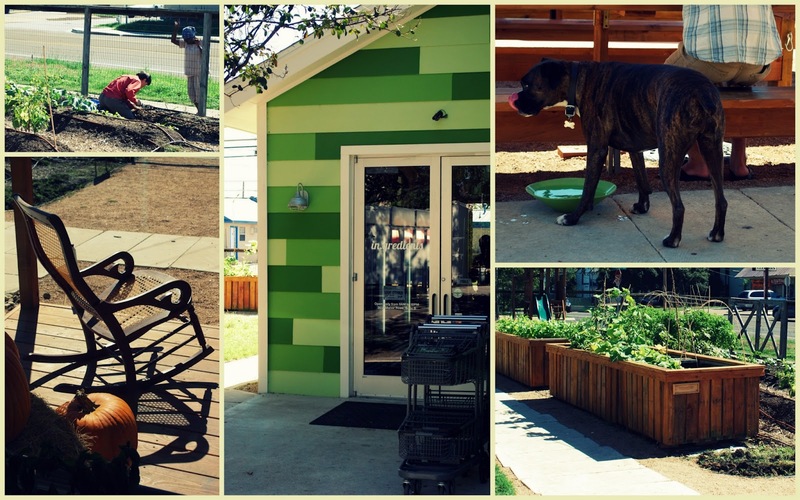 In part one of this series, we visited Austin's premier package-free microgrocer, in.gredients, which opened in early August to a fan-base-awaiting, filling the need and desire for locals to source their foods just in the way this happy little market offers: fresh, local, pure, sustainable, and as close to zero-waste as allowed by law. I'd been waiting to see just how all this would play out, and, if it was truly a viable alternative to the larger markets I'd been used to frequenting. Would it be friendly, and welcoming to those who may be less sustainable-savvy? Would they practice what they preach? Would it be well-stocked? Would it have everything I need for a meal? Would it carry products that satisfied the less than vegan-strict? And most importantly for this stick-to-a-budget farmer-type--would it be affordable? We answered many of those concerns in yesterday's post, where you can get a look at just how things look, and work. The answers? Yes! Yes, it was friendly, welcoming, well-stocked, and holding to the mission they've set forth, seemingly from corner to corner, wall to wall, front end and back. And yes! Everything I needed for the meal I planned to throw together for a few friends. A few carnivorous friends, I might add. A few friends that were a bit skeptical--it sounded all rather granola-crunchy to them. They feared I'd feed them (more) kale and tofu, less meat and potatoes. And they'd be wrong. Because cheese, eggs, meat, seafood, chicken, breads, prepared foods---they we're all there. All pure and local where possible, and primarily package-free (though necessity requires some items to be sold packaged, like the bacon, below). I buzzed happily around the small shop, hunting and gathering to my heart's content. In a medium saucepan, add water to dried navy beans to cover, plus an inch above. Allow to soak 8 hours (alternatively, bring to a rolling boil, then remove from heat and cover for at least one hour). Drain completely. Refill with fresh water, again to one inch over level of beans. Add garlic, and 2t kosher salt. Bring to a rolling boil, then reduce heat to simmer, covered, until beans are just tender, about an hour and fifteen minutes. (I do like my beans to be a little mushy upon serving, but these beans will be roasting with other ingredients for roughly an hour, so we're stopping just shy of completely cooked, at this stage.) Remove from heat. Drain, reserving liquid, and place in a large casserole or dutch oven. Add dried vegetable stock to warm bean 'liquor', stir vigorously to blend well, and add water to equal two cups, if necessary. Set aside. How to manage your pumpkin: Slice pumpkin in half, lengthwise, scoop out the seeds, and separate from flesh, reserving seeds, and one half of the pumpkin for toasting, and roasting (which we'll do later this week). 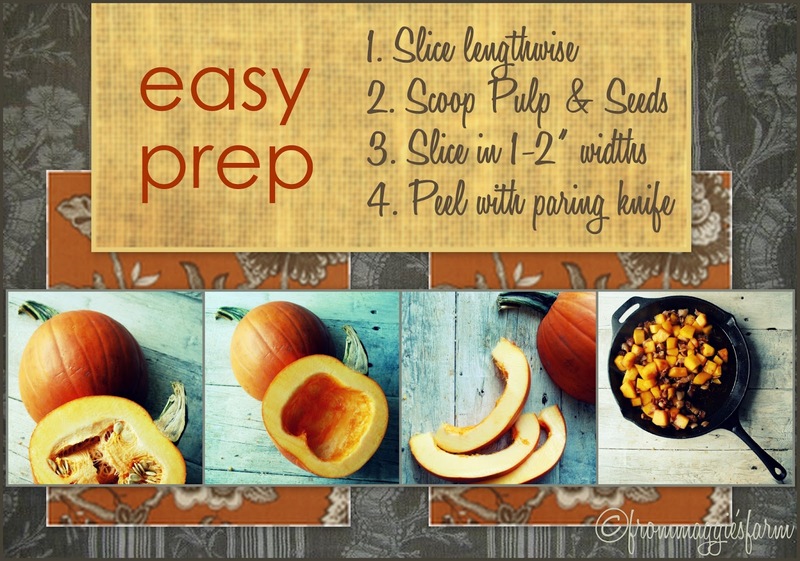 Slice pumpkin half into melon-sized slices, peel with a sharp paring knife (careful, there! ), then cube. In a large heavy skillet (I use cast iron, but in it's absence, any heavy-bottomed skillet will do, though preferably not nonstick), slowly render fat from cubed pork belly over medium heat. When pork begins to brown, and fat is translucent, add cubed pumpkin (see above). 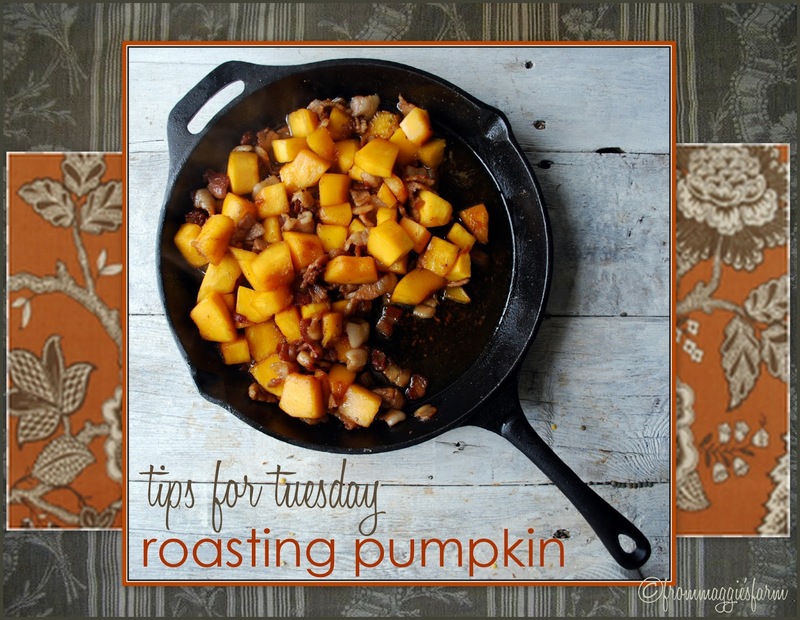 Increase heat to medium high, and toss pumpkin with pork belly in hot drippings, searing, and stirring well, until pumpkin is becoming tender and slightly browned on the edges, about 8 minutes. Drain excess pork fat, reduce heat to medium and toss pork belly and pumpkin with maple syrup until well coated, stirring often, for about 2 minutes. 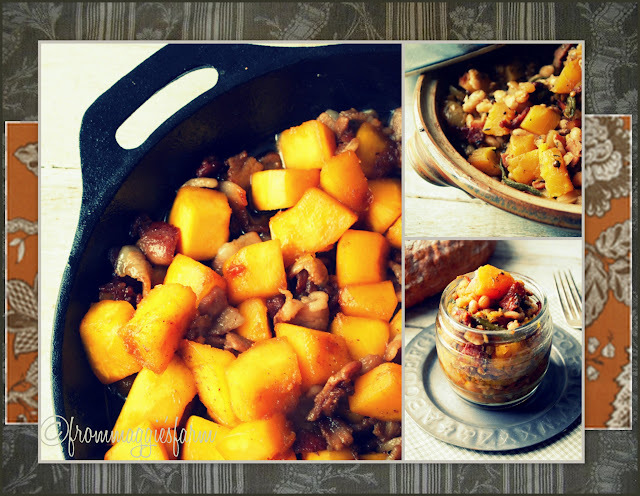 Add apple cider vinegar to deglaze the pan, stirring any juices around the pumpkin pork mixture. Remove from heat. 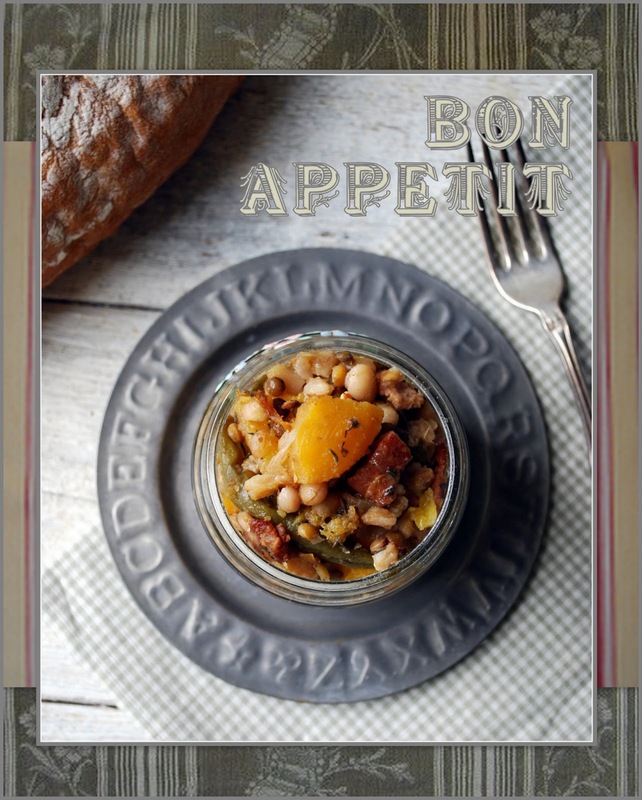 To casserole with cooked white beans, add pork and pumpkin mixture, reserved vegetable stock/bean 'liquor', dried french lentils, haricot verts, farro, cubed apples, and herbes de provence. Toss all togther, mixing well. Bake, covered, for about one hour, or until pumpkin and beans are tender. Correct seasonings, adding salt, to taste. Served with a loaf of crusty bread, this cassoulet yields 6 hearty, tummy-warming main dish servings, or 8 or more lunch-sized meals. 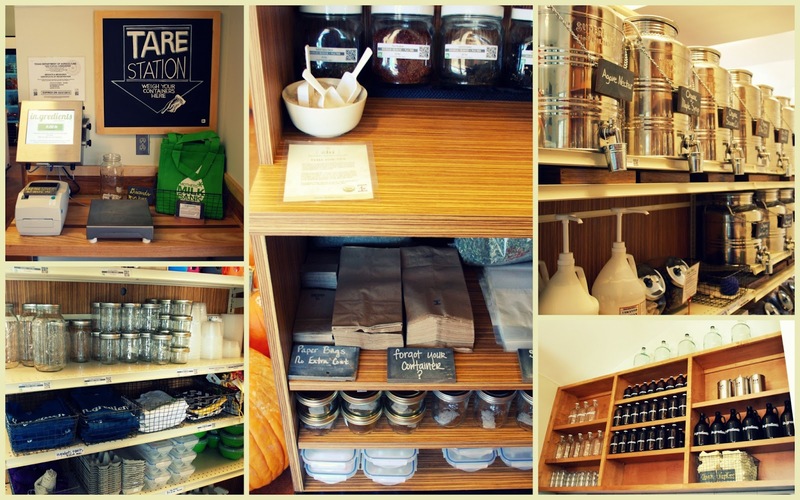 So, how economical is shopping at a package-free grocery? Well that was my question, too. For those of us who have to watch our pennies closely, is this a viable option for feeding our families? Let's see. My entire bill came to 35$ and some change. The cassoulet yielded 6 healthy main dish servings, and the loaf of day old bread I picked up more than met the needs of the table. My budget for most meals is 5$ per plate. If I factor in the items I bought, but didn't use in their entirety (garlic, one apple, one half of pumpkin, 3/4 of the amount of herbes de provence, and raw apple cider vinegar, and 1/2 the amount of dehydrated vegetable stock and pure maple syrup I purchased), the containers that I bought, but will use again, (2$ muslin bag, 4 plastic containers at .30/piece), and the serendipity of all those pumpkin seeds I'll be toasting to snack on, I met my budgeted allowance, and then some. Splurges on the recipe were the pork belly, at 10$/lb, and pure maple syrup, always a costly prospect. The raw apple cider vinegar cost more than I expected, also, but like its splurge-y counterparts, lent such intense flavor that less was needed than cheaper imitations you might find on larger market shelves, so I count that as a smart expense. To reduce the costs even further, and for those of you who observe vegan or vegetarian lifestyles, you might increase the quantity of farro (adjusting the liquid accordingly) which lends a nice, toothy texture, and omit the meat altogether. Simply sear pumpkin in a neutral flavored oil, also available at in.gredients. What no monetary value could be placed upon was the confidence with which I fed those precious to me, healthy, wholesome, clean foods, knowing I was also helping my community, and my earth, in the process. That, and the mmmm good's. That's always so nice. Part of the Plan: "Sourcing our food locally is extremely important. By buying and selling locally, we can stimulate the local economy, reduce the energy being used to transport food from region to region, and avoid packaging and preservatives since the product doesn’t need to stay “fresh” for weeks on end"
"Fresh. Local. Zero Waste. Pure in.gredients. 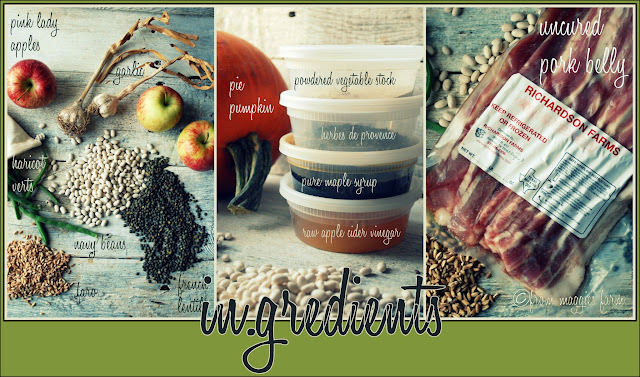 Sustainable food made easy." 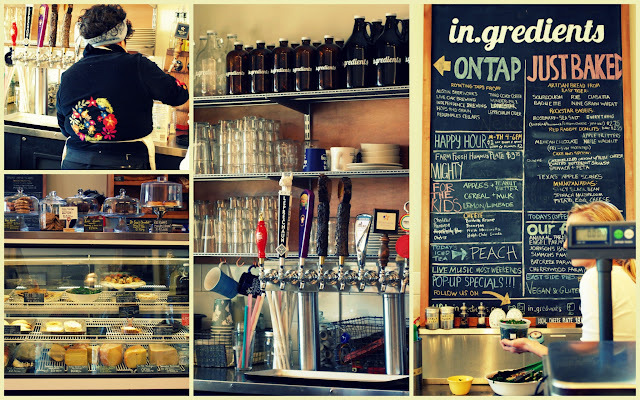 Along the side-walked line of Manor Road, fast becoming one of the hippest spots in an already ultra hip East Side of Austin, comes one of the newest kids on the block, in.gredients, the city's first package-free grocer. 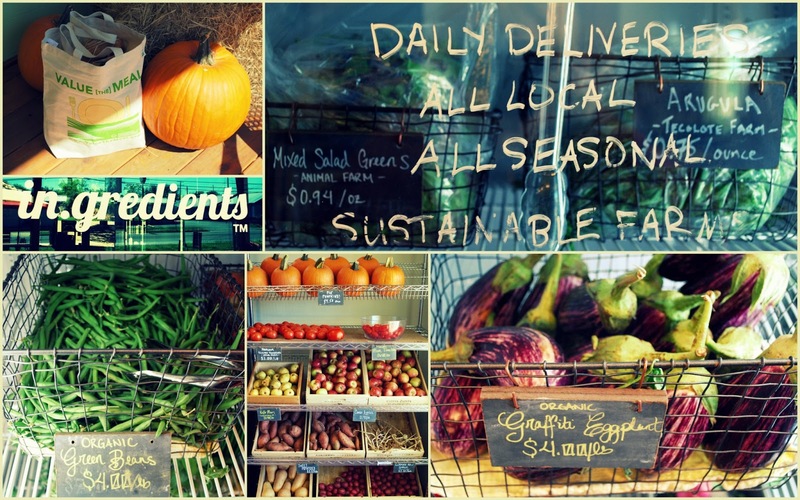 "A collaborative effort between business, community, and consumers with the goal of eliminating food-related waste while supporting local businesses and farmers", in.gredients hung their shingle out in early August of this year, and is open from 8am-10pm, daily. Part of the Plan: "We seek to eliminate unnecessary packaging in our microgrocer--on the front end (our shelves) and back end (how we get products from our vendors). We promise to offer our products in bulk and work with vendors who will deliver their products to us sustainably"
"Over 700,000 tons of garbage is placed in American landfills on a daily basis. Packaging makes up nearly 40 percent of that. Packaging waste is a big deal – especially when we’re consuming energy to produce, consume, and recycle things that aren’t always necessary. The way we do things now is damaging the environment at our own cost." -- from the website, in.gredients.com. Part of the Plan: "Food with pure ingredients is healthier than food with chemically-manufactured preservatives and artificial dyes. While almost all of the products we sell in our store are basic ingredients, not prepared foods, when we choose prepared products we ensure they contain pure ingredients and avoid products with artificial additives or controversial ingredients"
"Our mission is to minimize waste and promote healthy, sustainable lifestyles by selling local food with pure ingredients, package-free." It was a joy to visit this small grocery, but micro didn't mean incomplete. 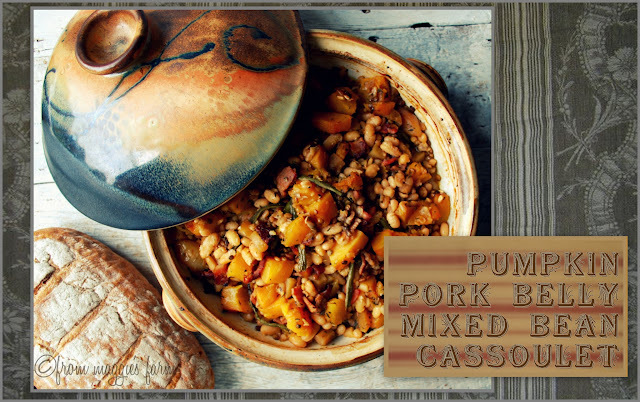 I was able to procure everything I needed, thanks to helpful and enthusiastic team members, for what I'd planned to make to enjoy a sunny fall supper on the porch-- Pumpkin Mixed Bean Cassoulet with Pork Belly, with their abundance of fresh, wholesome, local product. I can't wait to share the results, the recipe, and more about my visit, with you on tomorrow's post. Afterwards, I spent a little time on a sunny afternoon, enjoying the gardens, the tables, the interaction with community that in.gredients is building, and nurturing. Part of the Plan: "...We hope to teach our community how just a few simple changes to the way we live can reduce waste and promote healthy living. We strive to be actively in.volved in our local community, and have designed our store to maximize community on-site. We’d love for you to join us." We've been looking forward to this for weeks, and it's here! 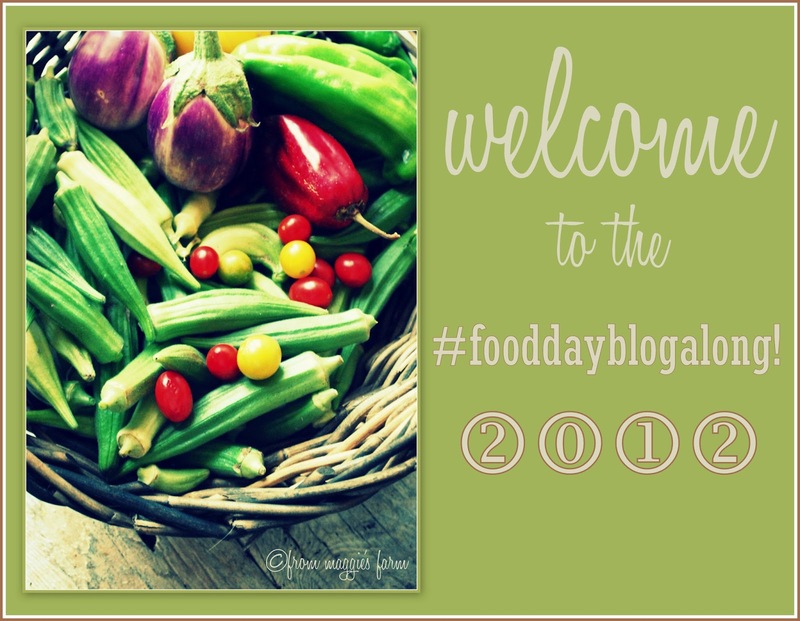 Welcome to #FoodDayBlogAlong, in observance of Food Day 2012.
and more! Check back for posts from sharp and savvy bloggers posting all day long! Need ideas? Be sure to check out this post for a thorough list of conversation starters that Mary has put together. Publishing your Food Day post (or posts) on your own blog. Leaving a link to your post in the comments on this post, or send the link to us via email, through the email button in the above right column. Also include links to your Twitter handle and Facebook blog page, if you have them. That will make it easier for us to promote you and your post. Check out your fellow bloggers' posts, and perhaps leave a little note of encouragement in their comments section. A nice way to 'pay it forward' in honor of Food Day 2012! 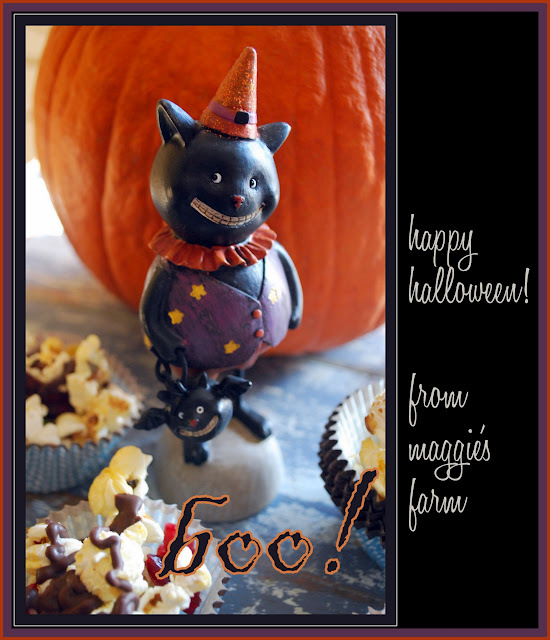 We'll publish a list of all posts on Mary Makes Dinner and on Notes From Maggie's Farm on Food Day, October 24, 2012. That's today! You can help promote the Food Day Blog Along using the hashtag #FoodDayBlogAlong on G+, Twitter, and Pinterest! We'll email each of you with the list of posts so that you can promote them too. And don't forget to check in with FoodDay.org, where the discussion goes nationwide, with resources and events that will inform, encourage, and empower you all day long, in their celebration of and a movement for healthy, affordable, and sustainable food. A few weeks ago, I had the distinct pleasure to join my friend, Mary, of Mary Makes Dinner at the SXSW ECO conference in Austin. We had to opportunity to learn about new ideas from experts in topics of conservation, sustainability, green energy, and more. Particularly exciting was the inclusion of so many food supply-related forums, a subject near and dear to our hearts. I wanted to soak in every word to share with those of you who are interested, like we are, in leading a healthier, more sustainable lifestyle. And I wanted to hear what you had to share, too! 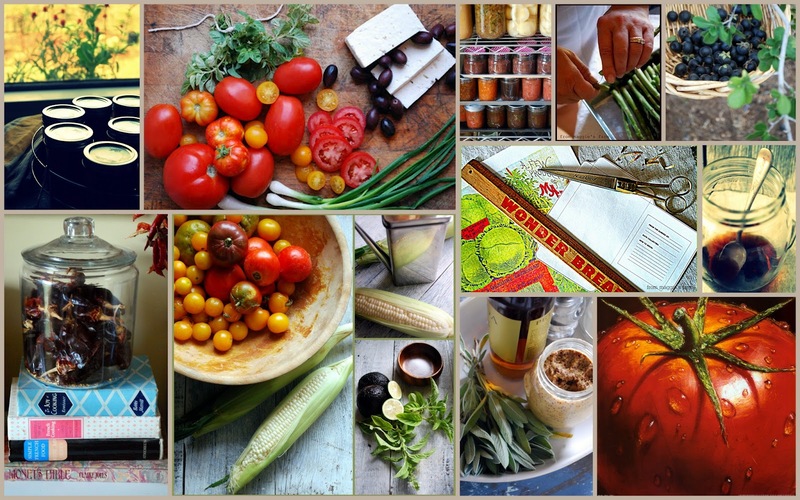 We got to thinking.....what if we could have an open dialogue with like-minded bloggers out there, and what better time to launch the discussion than Food Day, a "nationwide celebration of and a movement for healthy, affordable, and sustainable food." Let's blog together to make a difference for what we love most, food! Special Diets: Vegan, Vegetarian, Etc. I look forward to sharing my own experience with in.gredients, "Austin’s zero-waste, package-free microgrocer selling local food with pure ingredients", and the fantastic (if I don't say so myself) full meal I made from all products sourced from their stock of seasonal, sustainable, and locally-grown food, along with spices, grains, seasonings, and condiments that they offer as well. It's an exciting prospect! Where/When Should I Write My Blog Post? Publish your Food Day post (or posts) on your own blog between now and Tuesday, October 23, 2012. Leave a link to your post in the comments on this post, or send the link to us via email, through the email button in the above right column. Please also include links to your Twitter handle and Facebook blog page, if you have them. That will make it easier for us to promote you and your post. 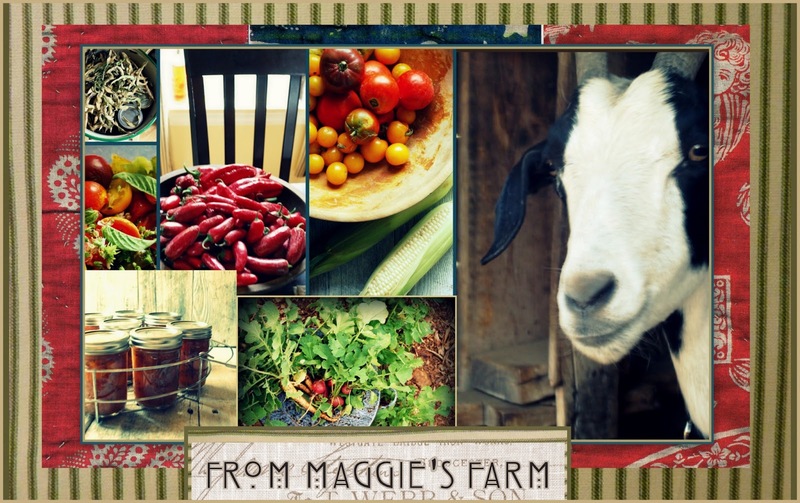 We'll publish a list of everyone's posts on Mary Makes Dinner and on Notes From Maggie's Farm on Food Day, October 24, 2012. Visit FoodDay.org for more information on Food Day, and for resources on the topics you plan to write about. Visit OrganicConsumers.org for information on organic food, legislation, activism, GMOs, and more. We've already received some excellent posts, and more are coming in! Won't you join the conversation? Oh how I'd hated okra. Mom loved it. Dad loved it. Aunts, uncles, grandparents all loved it. And there it was. In my garden. Flourishing so beautifully. Out-performing almost every other vegetable in the field. So I picked it and pickled it and canned it—copious jars of a favorite of so many, creole stewed okra with tomatoes. My husband ate it. My Dad ate it. My friends ate it, and more than a few customers ate it. I saved it for all of them. I was still not a fan. Oh, I mean I ate it, occasionally. If I had a big hunk of glorious cornbread, I was willing to share it with a dot of the stewed okra, and that was pretty darned good. The seasoning was pretty lively. But still, that okra. I realized I was not practicing what I preached. 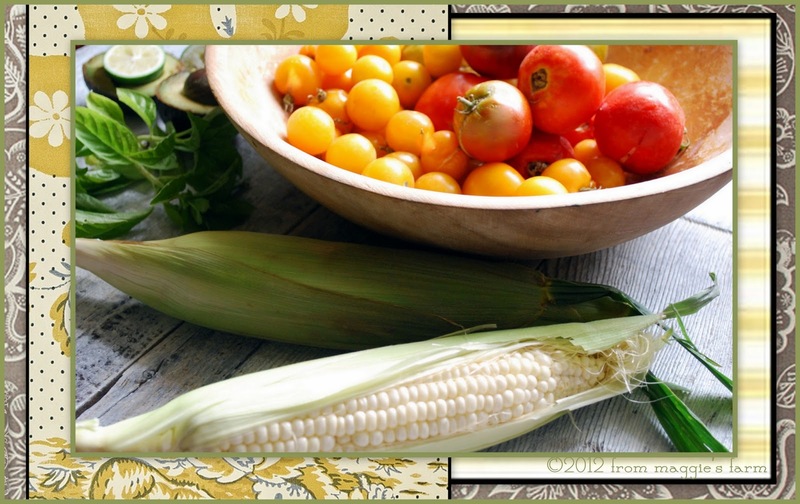 Eating seasonally, sustainably economically—well it was going to entail me eating the very crop that, these last weeks, was growing most abundantly in this warm, dry, Texas climate. I needed to eat more okra. Now, in all fairness to okra, I wasn't all too fond of many other vegetables, save for what I ate in a big bowlful of salad, for many years, either. I'd prepare fresh vegetables for my family, but, shamefully, left all but an exemplary bite from my own plate. But documentary after documentary, book after book, article after article, and, yes, even a doctor or two convinced me that adding more plant life to my diet was the way to go. So, out here we came, to raise our own. 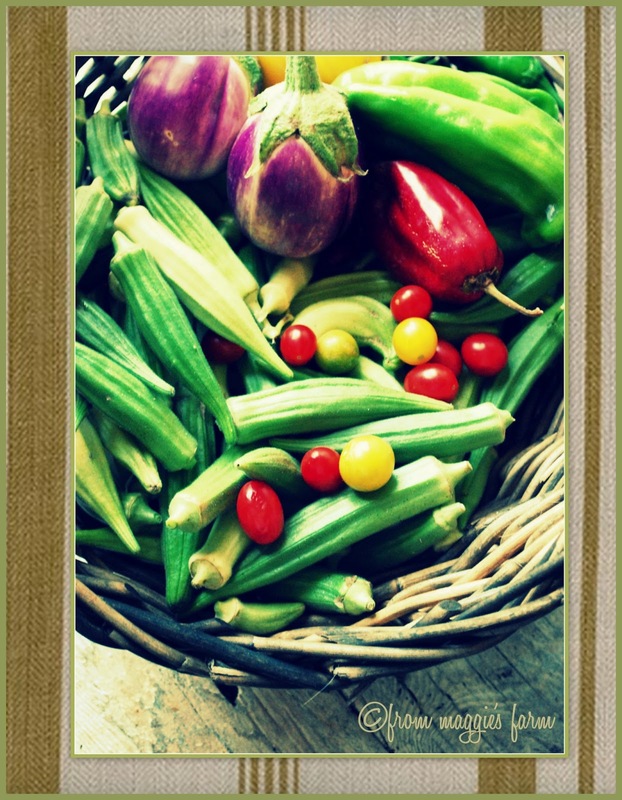 Organically-grown, nurtured, watered, those vegetables started to spring up, and I learned how to eat them. Not fried. Not boiled to death. Not slathered in creamy sauces, much. I learned to eat all those vegetables I disdained….roasted! So there! The answer to my dilemma! 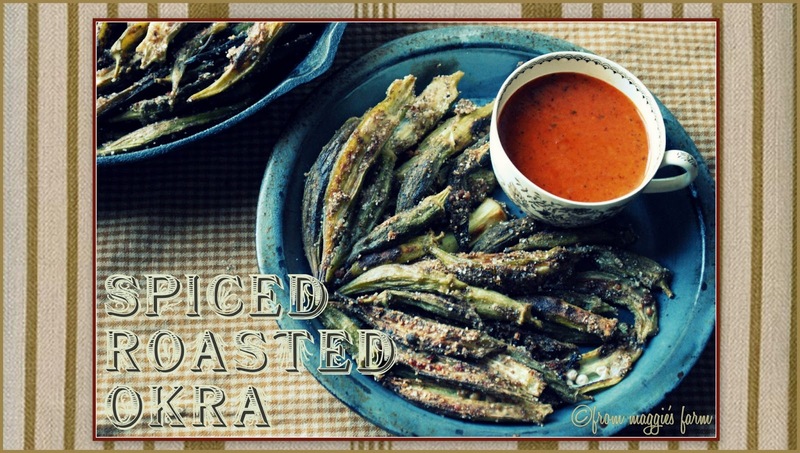 I roasted okra! In fact, I LOVED it. I ate whole meals of it. Even without cornbread! Combine cornmeal and garam masala spice blend. Toss prepared okra pods in a bowl with enough olive oil to coat. Toss, again, with cornmeal spice mixture. Layer a seasoned cast iron skillet, silicone pad-lined or silicone spray-coated baking sheet with okra in a single layer. 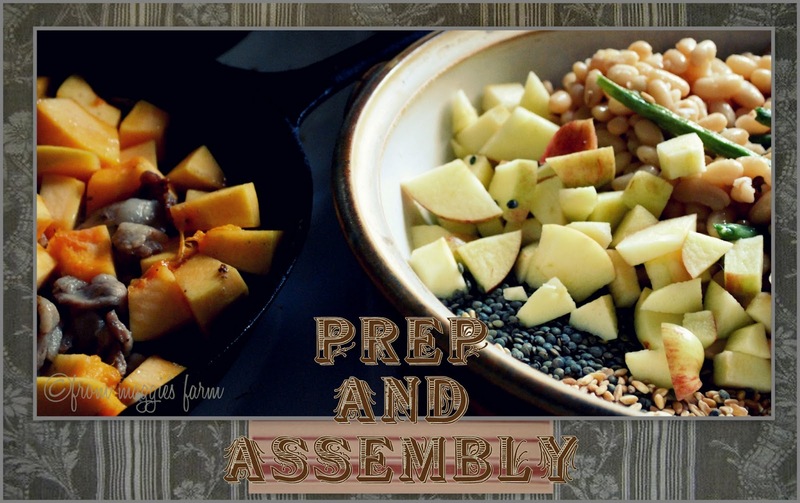 Roast in preheated oven about 30-40 minutes, turning once half-way, or until crisp. Correct seasonings. 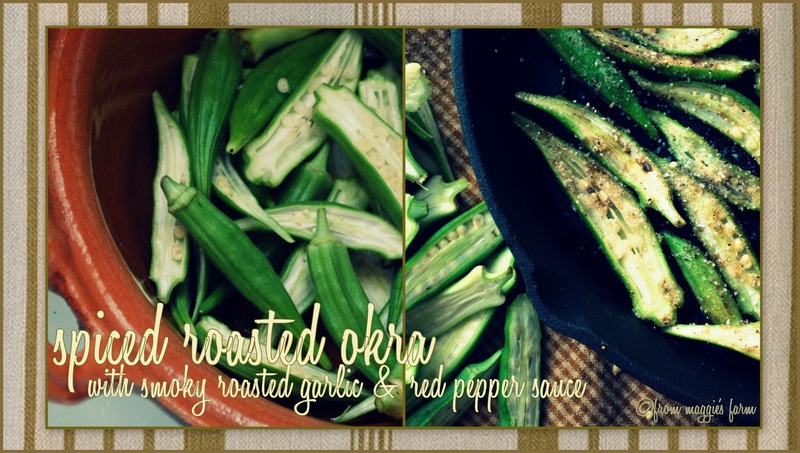 *Note about that okra. There are several varieties of okra, and each has it's size tolerance for woodiness. I've found that 3" is a good measure of each for remaining tender. Anything larger has proven to be an utter and total fail for this dish, and most others. 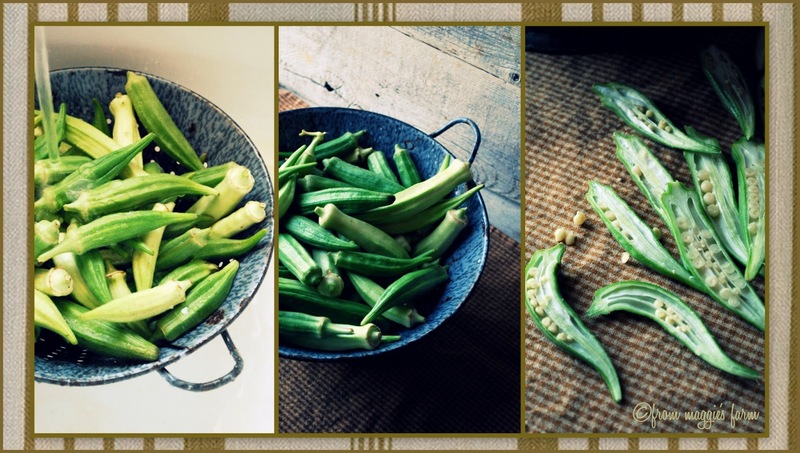 Okra lovers everywhere know this. Don't let anyone sell you the big stuff. We feed that to the goats. And even goats have their fill. And while we're on that subject...anyone who tells you that goats will eat anything? Well they'll be the ones who try to sell you big okra. Goats are very picky. Slice top part of bulb of garlic revealing tops of cloves. Wrap bulb, drizzled with olive oil, in aluminum foil, and roast in preheated 450° oven for about 30 minutes, or until tender. Meanwhile, roast peppers and tomatoes in a seasoned cast iron skillet in a preheated 450° oven for 15 minutes, or until tender. When garlic is cooled enough to handle, squeeze whole bulb to remove roasted cloves, which will be much like a thick paste, into a small saucepan. 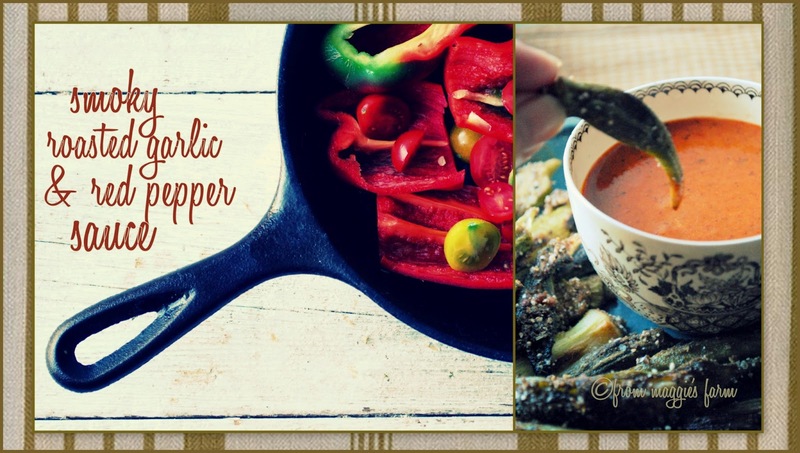 Add roasted peppers and tomatoes, and remaining ingredients. Bring to a boil, and reduce to a simmer for 15 minutes, stirring frequently. With an immersion blender, puree contents of pan until smooth. 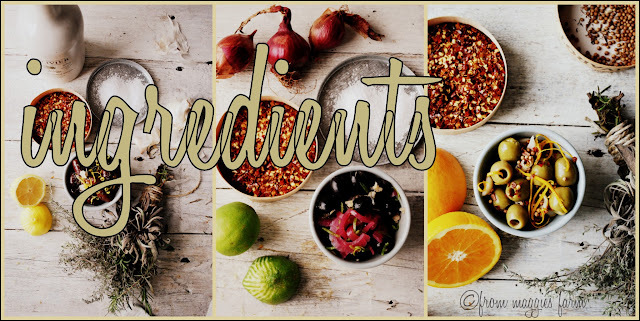 (Alternatively, cool ingredients, and puree in blender or food processor.) Adjust malt vinegar and sugar to taste. It's the season of celebrations. Football watch parties. Family get-togethers. Holiday soirees. And a cocktail party, or three, tucked in among the festivities. Your social calendar is likely filling up, and no proper guest need go empty-handed with a few of our Cocktail Nibbles in hand. First in this series, it was Gremolata & Olive Oil Roasted Edamame, designed to take the place of the ubiquitous, and, frankly, a tad bit boring, bowl of peanuts. Today, we're nibbling without even the need for heat! 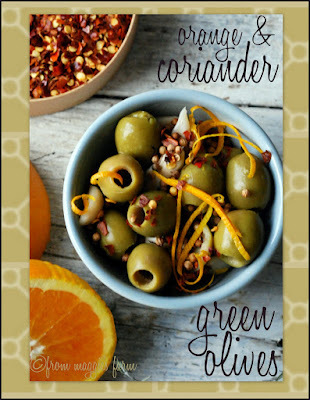 Easy, and quick to pull together, these Citrus Spiced Olives take no more work than a little zesting, pouring, and sprinkling. All you need is a few ingredients, and a little imagination, and you've dressed-to-impress a perfectly solid, but a bit staid, member of the cocktail party cast, with your own refusal-to-be-average flair. Well that's the easy part! 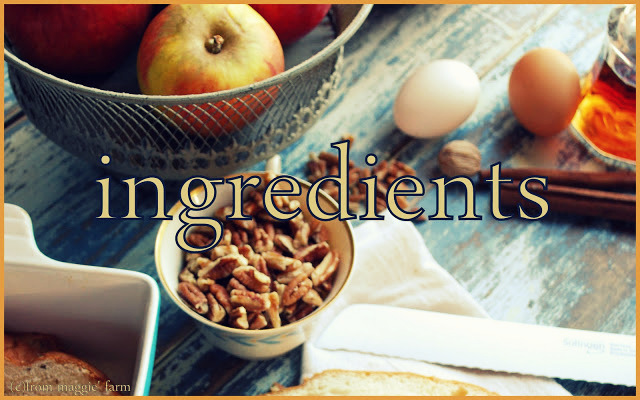 The list of ingredients is limited only by your personal preference, and creativity! Start with a bowlful of your favorite olives--we've used some very basic kalamata, ripe black, and Spanish green olives, but the next time we're in the big city, we'll pick up our favorites: oil-cured, Moroccan, and Nicoise olives from the bulk olive bins at the specialty market, to expand the selection we store just for such occasions. 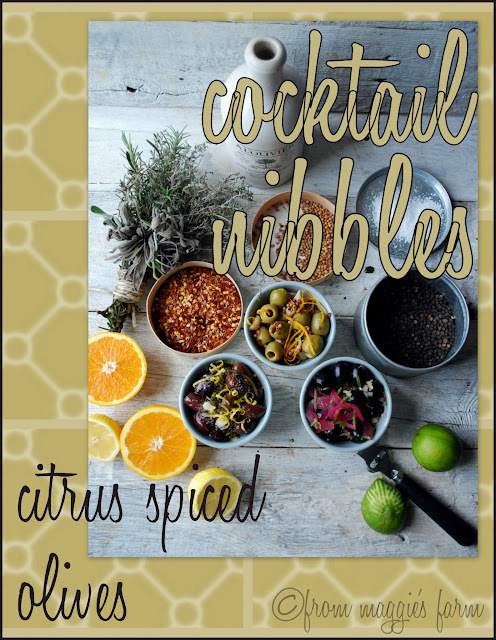 We love the fresh zing citrus zest lends to the earthy fruit, and local orange, Meyer lemon, and key lime are the one's we most commonly rely upon. Tangerine, citron, and more exotic citruses all provide bright notes worth experimenting with, too. Pull out your favorite spices and seasonings and play around with the pairings. Whole spices work best, and herbs, both dried and fresh, can be added by tucking in a stem, or crushing or mincing to release their oils. We sprinkle on just a pinch or two of crushed red pepper in almost every bowl we make, as an antidote to the luxurious headiness of a batch of these winsome beauties. Coarse kosher and sea salts complement oil-drizzled bowlsful perfectly, too. Simply stream a little of your favorite best-quality olive oil over the little spiced and seasoned mounds of velvety jewels to keep them moist, both during serving, and storing. We like the rustic, buttery textures of Italian olive oils, but often branch out to sample the grassy, bright, green flavors of oils from France, Greece, Spain, and even Texas. 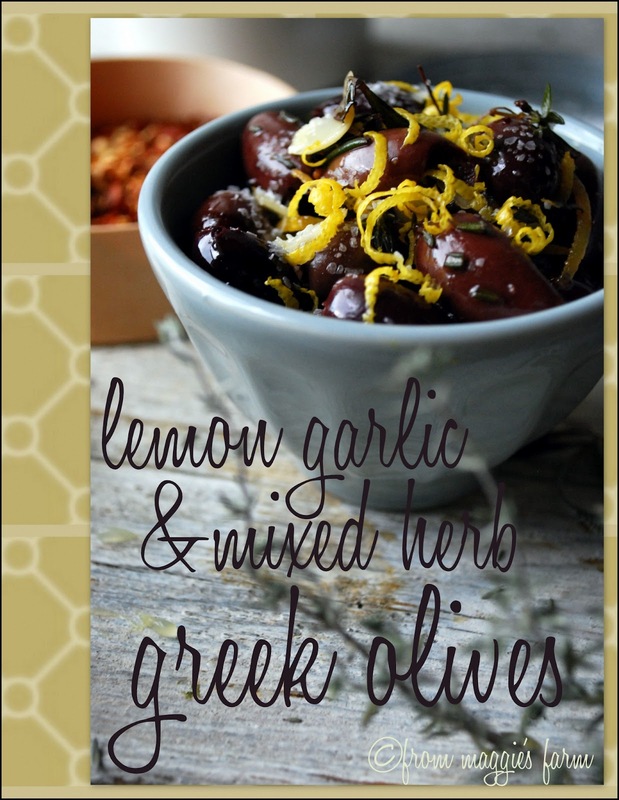 To a bowlful of pitted kalamata olives, add the juice of half, and the zest of a whole lemon, crushed dried thyme and rosemary, and a clove or two of finely slivered garlic. 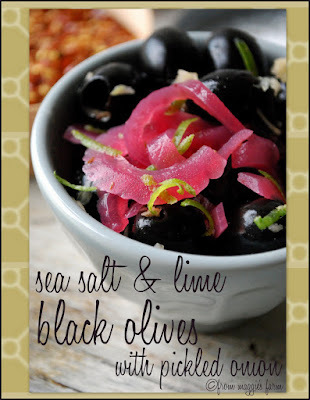 We tossed these ripe black olives, leftover from a recent Spanish meal, with the zest of a a lime or two, szechuan peppercorns, and strewn with some quick-pickled onions, a condiment we can't seem to live without these days. One of us round here, and I'm not mentioning any names, likes a martini on rare occasions. We snagged a few green olives from his the standard supply, added the juice and zest of one small orange, a sprinkle of crushed red pepper and whole coriander seed. We absconded with a few of the pickled garlic cloves someone was hiding on the cocktail cart and tucked them in for good measure. 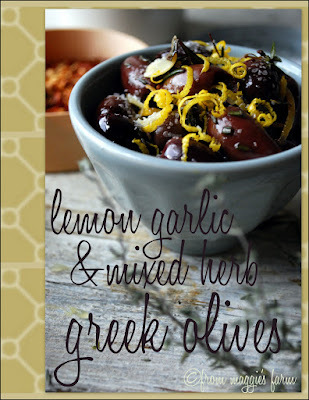 Now that oughta get you started on your way to your own special magic bowl--just add your favorite olive oil to the mix of each batch, above, as well as your own, let it sit overnight for a well-and-proper marriage of flavors, then bring to room temperature before serving. Makes a nice host/hostess gift for the olive-lovers on your list, too! meatless mondays please pass that okra!